During the half term holiday I was asked by a colleague to consider expanding on and to present some of the ideas surrounding a principle that underpins much of my work using ICT for communication with students, and so how I hope to develop use of mobile and web 2.0 tools within and beyond the classroom in school. This post sets out to introduce the principle of "collect, store, prepare and share," a concept I encountered at HHL07 but adding a personal twist, using a number of tools and examples to model and introduce the essence of the process as it relates to my work in school. In the first example the context is personal use, and the tools though not readilly accessible for use in school, nonetheless I hope begin to illuminate the possibilities and the processes behind the principle. 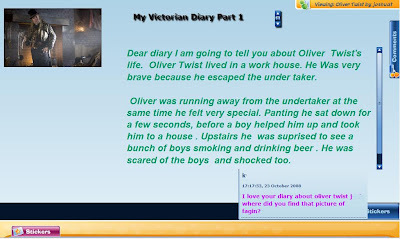 The second example is a more practical and down to earth example of how the principle underpins everday practice and the preparation of material to use with students, before finally beginning to develop how the principle fits in with the mobile and home school elearning project we are beginning to develop. 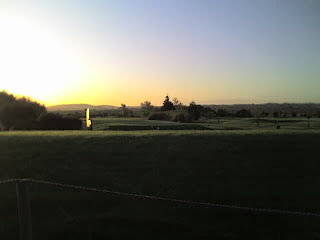 The first part of my story uses my mobile phone and the social networking tools Twitter and Twitpic, and begins early on the first Monday of half term, as the sun began hauling itself lazily over North Somerset's lower Mendips in to another day. 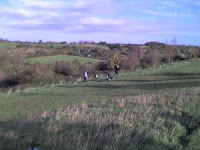 On this glorious morning I found myself here, with friends on our favourite 18 holes. It was a beautiful morning as you can see from the photograph. I really wanted to share it with my friends, not later but now. Not only the beauty of the place but the effect of the light on the alien object to the centre left, that gave the eerie feel to the space. I could have texted my friends, attaching the image, but wouldn't it be great if I could put the image in one place to share it with them simultaneously, and where I could go back to later, to download it or use as a reference point in other things we were doing like this? Captured on my Digital Camera I could share the image with friends when I got home, uploading it to a "share" space such as Flickr or Picassa. Since I had my Mobile phone with me, less bulky and cumbersome than my camera, and that I tend to carry for "just in case moments" I had the additional advantage of a direct network connection, and the possibility of using a space to store and share the moment directly and almost immediately. Attaching the image to a message I sent it directly to Twitpic. From here friends following me on Twitter were sent a message and were able to visit it on the web, to see where I was, what I was up to, and were able to leave a comment about it or should they choose, to download it or link to it themselves. Twitpic also allows annotation and labels to be added to support the image, or titles and tags to be provided. In this process I "collected" the moment, "stored" it on my phone, "prepared" it for upload before "sharing" it. Several other images were also sent to share visually parts of the story of my morning, and these appeared chronologicaly in my Twitpic space. For esafety reasons we are unlikely currently to use a site such as this with primary age students, but the possibilities for a less public moderated space, specifically designed for use in mobile learning and combined with the widespread availablity of camera phones, or web access through 3g and wireless enabled devices and environments do open interesting possibilities for platforms such as this to be used on school visits and so on. In the the not so distant future our previsits could enable the design of virtual tours using mobile devices to structure activities around particular aspects of a place. Inspirational projects such as Mudlarking in Deptford, and the Create A Scape projects carried out through Futurelab have begun to explore and model the possibilities of such ideas and for putting the tools to do so in the hands of the learner. There are also a growing number of downloadable MP3 and phone based audio tours already, one of which over the summer I used to help me explore aspects of Bristol's Docks. The principle of "collect, store, prepare and share" relies on a multiple tool approach and underpins many of the processes I personally follow when developing and making multimedia resources to use in class, and the teaching and learning processes I plan to help students compile and make Multimodal Texts. Inputting text, or copying, pa sting and reworking relevant text from the web or CD Roms we have in school, or perhaps from services such as Espresso. Locating useful websites to support our work, and bookmarking or saving their location (tumblr via Kwout or del.icio.us) or alternatively by copying and pasting to word, then saving as a Web Page. This would represent the collect and store part of the process, but as you can see from the twitpics example as a process the latter elements of this are fairly fluid and placing these materials in a shared network space at school will also allow for use by colleagues and students on later tasks, through adaptation. Developing hide and reveal or other tasks that include the tools we have brought together in the notebook to meet our intentions. The prepare part of the process is about adaptation, using materials we have found elsewhere and from multiple sources to create something new, personal or professional, something that meets our needs and designing for learning. The share event will happen when we use it for the first time in class, or so proud of what we have done we show it to a colleague, who also wants to use the material and we involve ourselves in a dialogue about how the tool will be used, or might further be adapted. What I find useful in looking at the process in this way is how easily I begin to see that many of the resources and tools I collected, prepared and stored, can be further adapted for sharing with and use by the students as extensions of the work we are involved in through the whiteboard as a shared space. Potentially framing ICT based multimodal tasks for students in local applications and tools or online environments. Since I already have the "raw material" I can develop and make tools to support table top tasks, to mediate talk for writing or ast as writing frames. Once I have undergone the "collect and store" process, the materials I have can be made available on the school's local network through a "shared space," or could be uploaded to an online share space such as Honeycomb, Think.com or our VLE, and from here the students can select, work with and use the material themselves to create and design new content. My own web searches will also give me some indication of the types of things that are returned from Internet searches, and help me structure, advise or support the children in the types of queries we might use to return the type of material we are looking for, or prepare me in advance to deal with the unexpected. If my intention is to create a text type, based on particular research focus rather than the self search process, then the bookmarks I collected can also be shared to provide and frame the work I want my students to engage with and sites I know will help in the process. This process I feel is a significant shift from what can be seen as teaching with ICT and technologically determined views that often see children plugged into the computer, practicing skills often out of context. It provides potential for an adaptable scaffolded approach, that challenges perceptions using ICTs to "hide behind." Collect, Store, prepare and share sees the user, the teacher in this first instance taking an active part in engaging with and modelling a process that uses a range of tools to support not only their own professional learning but also that sees the user as an active participant in the design and redesign of content, rather than a passive recipient looking for material that exists and just about meets our aims. It presents a model and expectation for our students that they too should learn to use a range of tools to engage with content available. So why did I begin by wittering about Twitter? Why talk about local networks and file sharing? What has using a local application got to do with online or e learning platforms? The "collect, store, prepare and share," process outlined in various ways above are key features of the principles underpinning my evolving views and many I have read around e and mobile learning, and are central to projects I am currently juggling with, have set out to develop within school and wondering about how to illustrate concretely to colleagues. The key tool in developing our projects will be the Asus EE "webbooks" we have invested in, not to work as standalone platforms, but to function as "collect, store, prepare and share" tools. The principle which underpins our their role does not see them as the sole devices that students will use in supporting learning with ICT, but as part of a wider tool set. As a platform it is envisaged, students will learn to use their Asus, as a local applications host in the first instance, a place to "collect and prepare" material to work on other projects, as a tool they can use in school and away to compile, edit and "collect" the resources and material they will need either for inclass use or to support the development of collaborative projects with peers. 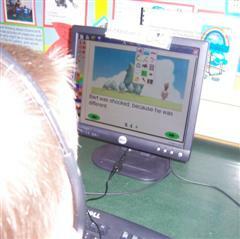 The process as envisaged will require web access and a networked view of learning as a process. The wireless enabled devices should allow us to use online tools such as our VL E, and plugin spaces we are currently working with such as Honeycomb and Think.com to enable students to prepare and share together the work that they are doing. The local model provided above is an illustration of how we as teachers can begin to engage with the principles and modelling process, and how the model works with tools we are already familiar. However we need to look beyond the technology, to see it as an enabler for changes in pedagogical perspective, a social as well as technological tool. The use of Twitter and Twitpics earlier is intended as an illustration of the potential immediacy and accessibility of online mediating and social sharing tools, how accessible and available we can make resources even in the remotest place. 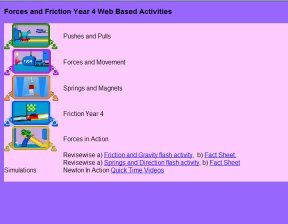 While the webbook and VLE represent a point somewhere in between, where we can begin work with colleagues and students alike in testing and exploring the possibilities and challenges to pedagogy these tools represent, while working from the familiar. I would value any thoughts and contributions readers might have around this that would help develop and extend thinking. The principles are intended from my point of view to help guide through the longer term aims and expansion of our project. They have implications for CPD, which have been raised and highlighted by colleagues. It is this alongside comments from colleague Doug Dickinson who suggested I should try to outline what I meant by the process that has prompted this post. I have referred to the principle in several previous posts, and the ideas behind it he suggested might be be helpful to share with other colleagues. I hope that this proves useful in terms of what he suggested, it has certainly helped me to begin to pull together some of my thoughts and tie together a number of previous posts.